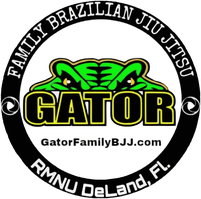 Adult BJJ Program - Gator Family Brazilian Jiu-Jitsu, DeLand Fl. Adult Class for fun, fitness, Self Defense, and competition. No experience required. Our team will help you every step of the way. Warm up drills will build your cardio and help keep you flexible. Practicing the techniques demonstrated will get you ready to defend yourself in a real world situation. While grappling you will gain hands on experience while learning self control, patience, respect, and confidence. Join our Team the 1st Saturday of the month for a field trip to RMNU Headquarters to train with World Champions and Professor Robson. Contact us to learn more.